Social Media allows the sharing of information and ideas through a wide variety of people all around the world. According to an estimate, there are around 2.77 billion people on social media in 2019. This is a huge market spanning the entire world just a click away which can be accessed on your computer from the comfort of your workplace or your home. This is why marketing through social media is one of the most cost efficient that enables even the smallest enterprises to reach to a versatile group of potential customers and their target audience. At present, around 97% of companies use social media for marketing. Social Media tools can be used for conducting marketing research, tracking customer needs and feedback. Social Media can be used to track and analyze target customer conversations on the Web about their brand or products or bout certain areas of interests. This can also be used in the management of public relations and advertising campaigns. It can also be used to measure the cost-benefit ratio. It can also be used for promotion of discounts, relationship development. All the above-mentioned points are applicable for a book publisher too. Online Learning Management System had seriously proven its firmness in the field of education. Social Media has been proved as a great marketing platform for books and that is why it is on the top priority for many authors. There are a lot of authors promoting their book on these platforms and steps must be taken to stand out from the crowd. Only making the masses aware of your book (that it is in the market now) is not enough. The readers must get extra information about your book through the ad campaign. Your friends buying and supporting your book is not sufficient. Their friends must get interested too. They will get interested only through the information they get about your book. This is what is required to be focused on. Platforms like Goodreads allow the users to search, review and suggest books. It is a group of book lovers and if the message gets through then you will be directly in touch of a huge pool f potential buyers. A serious attempt on platforms like this can prove very helpful in improving the longevity of your book. If you want to rise above the competition what is applicable for the traditional markets is applicable for this platform too. You have to be aware of the type of audience using each of the social media platforms and shape your marketing campaign according to that. What is meant by the above statement is that the kind of message you use for say twitter cannot be used while writing a blog about your book. A message on twitter will be short and be a summary of what the book is. You would be introducing the book to the readers here but in the blog, more detailed information of the book will be given such as what to expect and what your inspiration for writing this book and what message you hope would reach the reader. A person on twitter would be scrolling through your posts and to grab his attention you have to be short and petite n your expression. Perhaps the top cover your book and a link to the blog where you have to describe your book in detail can be shared there. If you have a separate fan page on Facebook make use of that and ask your followers to do the same. A page like this enables interaction and discussion about the book and that in turn generates the buzz that is required for the promotion of the book and getting the word out there beyond your immediate contact. Also, ask people who have read the book to share their thoughts on the page. That will also be helpful. It is quite evident that you will tweet about the book which will result in retweets. Make sure to share the link of the blog where you describe the book and also the link which can be used to purchase the book. While tweeting, do not overdo it. Do not tweet frequently and make sure to not make a hard sales pitch. You can share interesting lines from your book which will generate people’s interest and will also result in a lot of retweets. The people who read blogs are generally the ones who are more patient and like to make an informed decision. You have to keep that in mind while writing the blog. Share intriguing information about the book and why the book is relevant in the current atmosphere. You can always share your best line from the book to further bolster the interest of the reader. Always share the link of the blog wherever you choose to make the book. Do this while making updates too. Ask your blog subscribers to share the information about the book among their networks and books. 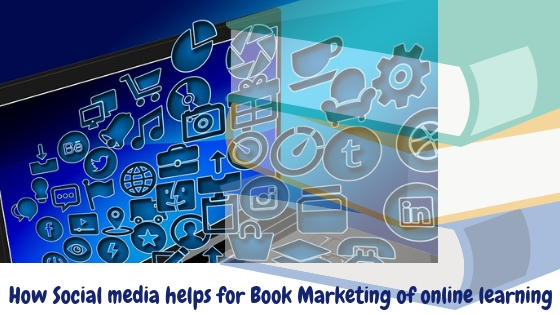 Concluding with the fact that there are many effective ways to enhance book marketing through the means of social media. It should be used wisely and judiciously popularize book marketing. Guest article written by: Sunny Chawla is a Marketing Manager at AIS Technolabs. Web-design, Development Company, and Iphone Application Development by helping global businesses to grow with E-Learning Platforms. He would love to share thoughts on Android App Development Services, Digital marketing etc.. LinkedIn, Twitter, Facebook, Google+.